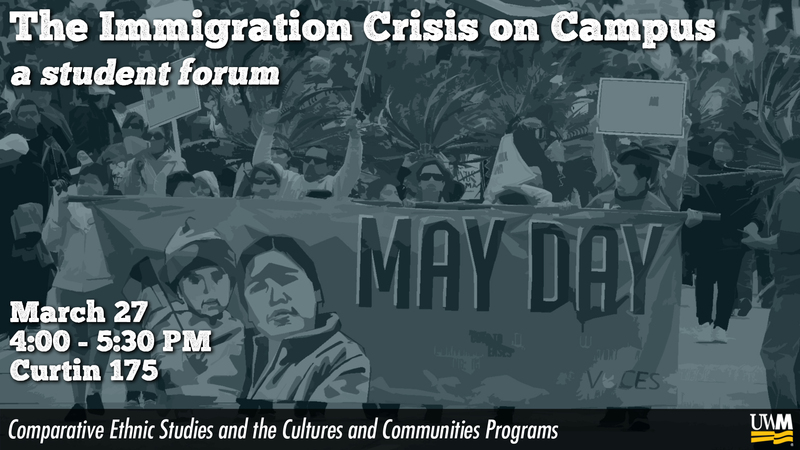 Join us on Tuesday, March 27, 4:00pm in Curtain Hall 175 for a special student forum exploring the immigration crisis as it has played out and been experienced on campus. We will consider how global/national issues of (im)migration have important local implications, with significant struggles and resistance work happening right here at UWM. 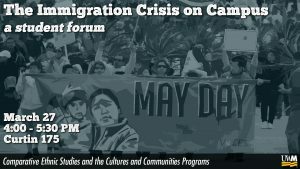 Panelists from UWM’s migrant communities and immigrant rights groups will discuss their experiences and work surrounding immigration and refugee issues on campus, which will serve as a foundation for a larger discussion of the crisis politics of immigration locally and globally. This event is organized and sponsored by the Cultures & Communities and Comparative Ethnic Studies programs.